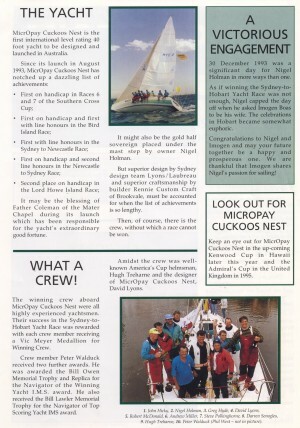 Cuckoos Nest was the first international level rating 40 foot yacht to be designed and launched in Australia. It may be the blessing of Father Coleman of the Mater Chapel during its launch which has been responsible for the yacht's extraordinary good fortune. 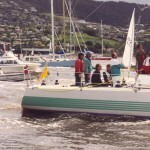 It might also be the gold half sovereign placed under the mast step by owner Nigel Holman. But superior design by Sydney design team Lyons/Laubreau and superior craftsmanship by builder Rennie Custom Craft of Brookvale, must be accounted for when the list of achievements is so lengthy. Then, of course, there is the crew, without which a race cannot be won. 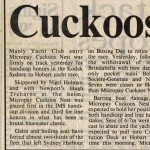 "Most Hobart's have a tough patch, as you'd expect in a 600 mile race, but what made this race so unusual was the consistently tough conditions," said Nigel. "Everybody asks if we thought about giving it away, but there was never any thought about packing it in. 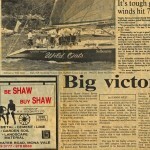 We know the boat was sturdy, the crew was good, the sails were great - there wasn't a weakness there". "I prayed that God would make the wind go away, the sea go down and that we could carry on and win. Well, HE obviously decided HE was going to keep it tough for us, so HE gave us one out there". 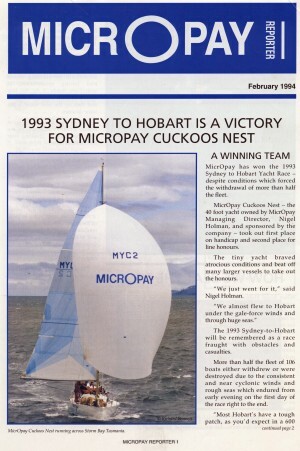 Tasting the winning cup in the Sydney-to-Hobart in December 1993 meant that Micropay Cockoos Next also won the Southern Cross Cup which is related to seven races of which the Sydney to Hobart is but one. 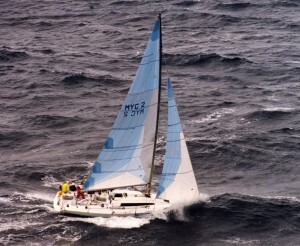 Congratulations to Nigel Holman and the whole crew who sailed their four-month old yacht to the winning line. 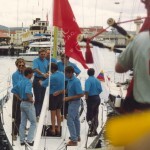 When Nigel Holman decided to compete in the Sydney-to-Hobart Yacht Race, he spared no amount of time and commitment to ensure his boat and the crew would be thoroughly prepared for the event. 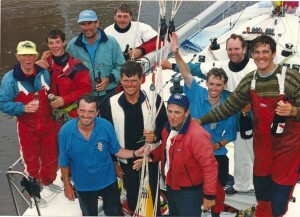 It was the combination of good preparation, a great crew and judicious, conservative sailing which led to the victory. "A lot of people who eventually finished the race put up their smaller sails and then basically went into survival mode as opposed to race mode," said Nigel Holman. "We had total confidence in our vessel and the crew. All we needed was to maintain our determination to battle the sea and to ensure our decisions were timed to meet the challenges." "And so, having put on the small sails, we then went as fast as we could, so that we were doing about 10 knots in 50 knots of wind - we were just flying", he said. When asked if there was ever a stage when he felt the event had become too dangerous, Nigel said there was not. "There's a difference between being dangerous and being scary. Dangerous, it was not, because the boat was so solid. Scary, it was - very." "The sea was wild, with waves some three-storeys high. "It was like going up a steep hill, the boat being propelled only by a sail and the wind. "If felt as if you were in a Morris Minor, struggling up a hill, wondering if you would make it to the crest. Just as the boat seemed to be slowing down and losing momentum, it somehow made it to the top and then flew down the wave and then up the next wave in the same manner. "Every now and then, a wave would break, suddenly, as we were mounting it, crashing over the boat and crew. "In those moments, we all just hung on to anything we could hang on to." said Nigel." It was these rough conditions which forced many boats to withdraw and with each withdrawal and wounded vessel many dreams were shattered. "While we were sorry to hear of the many withdrawals, we were confident in our ability as a crew and in our boat and we tended to focus on winning the race. Battling the elements became a secondary concern," said Nigel. "There are so many emotions associated with the race. "Most significant of all, though, was the despair and anguish experienced when hearing the news that John (Quinn) went overboard from the Mem. The grief felt for John was enormous, but I also felt so sorry for his crew, knowing their despair and what they must have been going through. The fact that John was later found and rescued was miraculous." "When the race was over the sense of satisfaction for having achieved so much was tremendous. It was determination and good team work which got us there. "It really was a chastening experience," Nigel added. 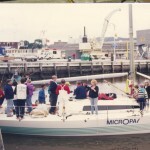 The winning crew aboard MicrOpay Cuckoos Nest were all highly experienced yachtsmen. 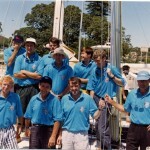 Their success in the Sydney-toÂ­ Hobart Yacht Race was rewarded with each crew member receiving a Vic Meyer Medallion for Winning Crew. Crew member Peter Walduck received two further awards. 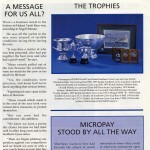 He was awarded the Bill Owen Memorial Trophy and Replica for the Navigator of the Winning Yacht I.M.S. award. 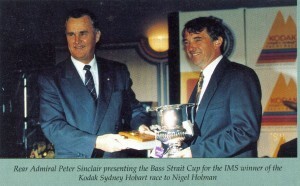 He also received the Bill Lawler Memorial Trophy for the Navigator of Top Scoring Yacht IMS award. 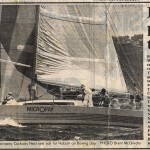 Amidst the crew was well-known America's Cup helmsman, Hugh Treharne and the designer of MicrOpay Cuckoos Nest, David Lyons.